The Equinox Housing for Canon 5D Mark II and Custom Lens is a durable polyvinyl carbonate waterproof housing for your Canon EOS DSLR camera. 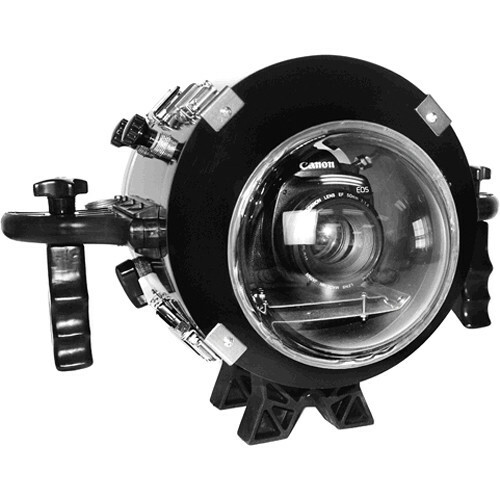 It enables you to shoot safely underwater with your camera to a depth of 250' (76.2 m) and has neutral buoyancy. The housing provides access to important camera functions, including Shutter Button, Menu Button, Menu Select & Scroll, Play, Manual Focus and Manual Zoom. The closer you are to your subject, the better your underwater video will be. The use of a wide-angle lens allows this to happen. By eliminating as much water as possible between you and your subject, you will increase contrast and improve color. This housing is custom-made for a specific lens chosen by you and supports wide-angle, telephoto, standard lenses. It comes with a dome port to accommodate your lens. The BRS / Ballast Release System serves a dual purpose: Easy travel and fast transport to the surface, should you run into trouble during your underwater video adventure. Simply pull on the quick release pin on one of the wings and the wing and ballast/handle are both released; the housing now becomes positive in buoyancy and shoots to the surface.